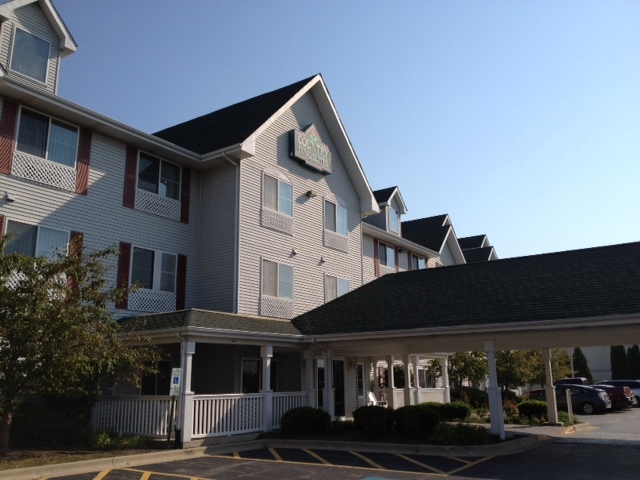 A sleepover at Country Inn and Suites in Gurnee, Ill. Most people staying at the Country Inn and Suites are there for one of two main attractions: Six Flags amusement park or the Gurnee Mills outlet shopping center. Unfortunately, we were there for neither. Ultimately, we were headed to Kohler, Wisc., and needed a place to stay for the night. My son, who is in football, was scheduled to have practice until 8 p.m. the day we left, so I searched for a hotel north of Chicago that we could stay at the for the night. Then, we could wake up, not have to battle Chicago traffic and have a short drive to our final destination. Fortunately, or unfortunately, my son fractured his finger in a practice earlier in the week, so we were in the clear to leave after I got out of work. We had decent traffic and found our way easily to the hotel. We checked in and got to the room when I checked in on Foursquare and found that we would receive a free pay-per-view movie for the check-in. When I went to the front desk, the young lady there didn’t know what Foursquare was and didn’t even know that the hotel had pay-per-view. She said she’d contact her manager and get back to us but we never heard from her again (and decided to just head to sleep). In the morning, we got up for the included breakfast. Our kids love the waffle machines at hotels, ,along with being able to select from several types of cereals (and always on the lookout for a blueberry muffin). The hotel had all of these and breakfast was efficient and satisfying enough to get us up and moving. We did not use the pool but it looked sufficient, yet small, for a stay but the hottub had a cover on it with caution tape. The workout room had two treadmills and an elliptical machine. We checked out, grabbed a couple of fresh chocolate chip cookies from the counter and were on our way. Overall, the hotel meet our needs for a family overnight stay.